Friday August 14th 1925 I was home all day. The girls took Lydia to Peoria by Auto in the afternoon. Home at 6.30. I wrote to L D L and LeGrand. weather pleasant. Evening on porch. Saturday August 15th 1925 I fixed a dress for myself in AM. Had a sleep after dinner. Wrote Rob Whetstone and Mrs Falk. I took the letters to the depot. The girls busy here. Letter from Hattie. 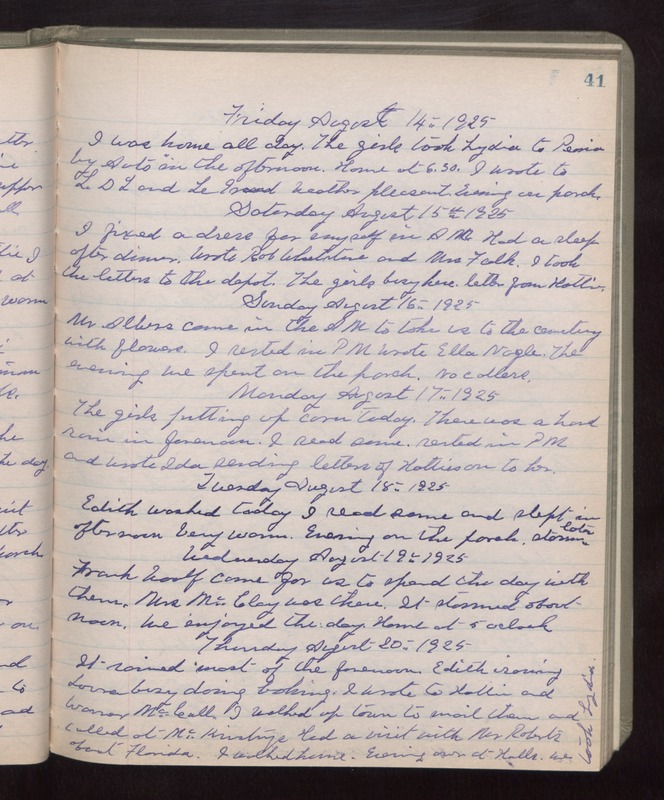 Sunday August 16th 1925 Mr Albers came in the AM to take us to the cemetery with flowers. I rested in PM. Wrote Ella Nagle. The evening we spent on the porch. No callers. Monday August 17th 1925 The girls putting up corn today. There was a hard rain in forenoon. I read some. Rested in PM and wrote Ida sending letters of Hattie on to her. Tuesday August 18th 1925 Edith washed today. I read some and slept in afternoon. Very warm. Evening on the porch. Storm later. Wednesday August 19th 1925 Frank Woolf came for us to spend the day with them. Mrs McClay was there. It stormed about noon. We enjoyed the day. Home at 5 oclock. Thursday August 20th 1925 It rained most of the forenoon. Edith ironing. Laura busy doing baking. I wrote to Hattie and Warner McCall. I walked up town to mail them and called at McKinstrys. Had a visit with Mr Roberts about Florida. I walked home. Evening over at Halls. We took Lizzie.